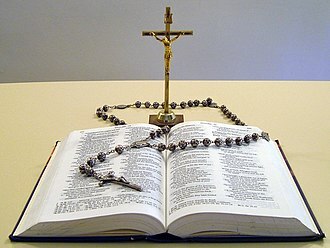 Gothic Christianity refers to the Christian religion of the Goths and sometimes the Gepids, Vandals, and Burgundians, who may have used the translation of the Bible into the Gothic language and shared common doctrines and practices. The Gothic tribes converted to Christianity sometime between 376 and 390 AD, around the time of the fall of the Western Roman Empire. 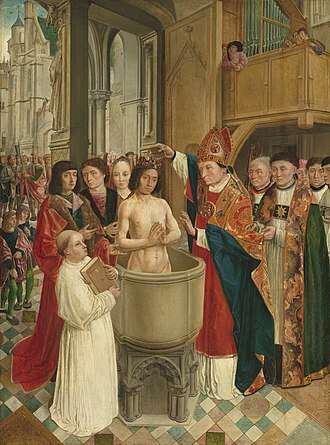 Gothic Christianity is the earliest instance of the Christianization of a Germanic people, completed more than a century before the baptism of Frankish king Clovis I. The Gothic Christians were followers of Arianism. 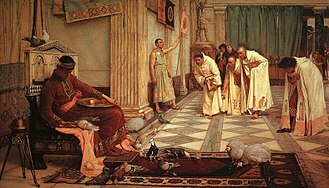 Many church members, from simple believers, priests, and monks to bishops, emperors, and members of Rome's imperial family followed this doctrine, as did two Roman emperors, Constantius II and Valens. After their sack of Rome, the Visigoths moved on to occupy Spain and southern France. Having been driven out of France, the Spanish Goths formally embraced Nicene Christianity at the Third Council of Toledo in 589. During the 3rd century, East Germanic people, moving in a southeasterly direction, migrated into the Dacians' territories previously under Sarmatian and Roman control, and the confluence of East-Germanic, Sarmatian, Dacian and Roman cultures resulted in the emergence of a new Gothic identity. Part of this identity was adherence to Gothic paganism, the exact nature of which, however, remains uncertain. 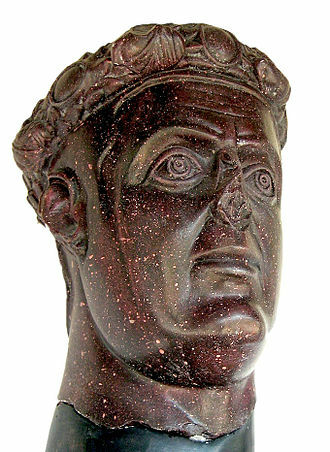 Jordanes' 6th century 'Getica' claims the chief god of the Goths was Mars. Gothic paganism derived from Germanic paganism. 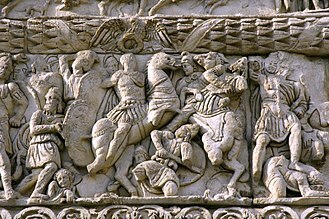 Descriptions of Gothic and Vandal warfare appear in Roman records in Late Antiquity, at times these groups warred against or allied with the Roman Empire, the Huns, and various Germanic tribes. 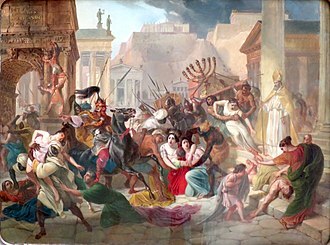 In 251 AD, the Gothic army raided the Roman provinces of Moesia and Thrace, defeated and killed the Roman emperor Decius, and took a number of predominantly female captives, many of which were Christian. 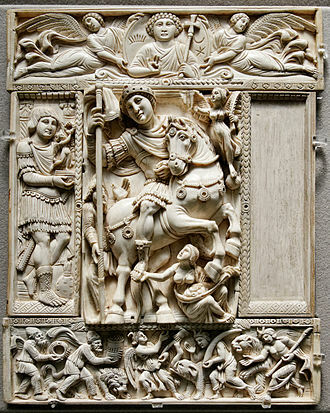 This is assumed to represent the first lasting contact of the Goths with Christianity. The conversion of the Goths to Christianity was a relatively swift process, facilitated on the one hand by the assimilation of Christian captives into Gothic society and on the other by a general equation of participation in Roman society with adherence to Christianity. Within a few generations of their appearance on the borders of the Empire in 238 AD, the conversion of the Goths to Christianity was nearly all-inclusive, the Christian cross appeared on coins in Gothic Crimea shortly after the Edict of Tolerance was issued by Galerius in 311 AD, and a bishop by the name of Theophilas Gothiae was present at the First Council of Nicaea in 325 AD. 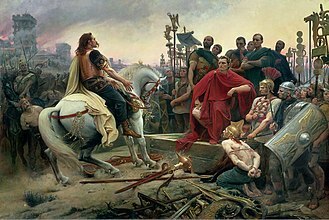 However, fighting between Pagan and Christian Goths continued throughout this period, and religious persecutions - echoing the Diocletianic Persecution (302-11 AD) - occurred frequently, the Christian Goths Wereka and Batwin and others were martyred by order of Wingurich ca. 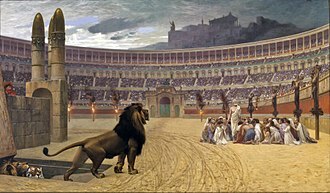 370 AD, and Sabbas the Goth was martyred Gothic persecution of Christians in c. 372 AD. 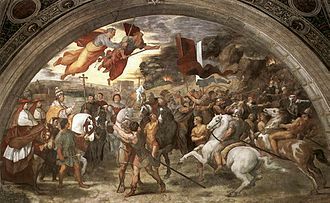 Even as late as 406, a Gothic king by the name of Radagaisus led a Pagan invasion of Italy with fierce anti-Christian views. 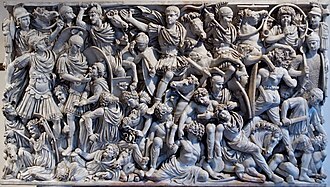 The initial success experienced by the Goths encouraged them to engage in a series of raiding campaigns at the close of the 3rd century - many of which resulted in having numerous captives sent back to Gothic settlements north of the Danube and the Black Sea. Ulfilas, who became bishop of the Goths in 341 AD, was the grandson of one such female Christian captive from Sadagolthina in Cappadocia, he served in this position for the next seven years. 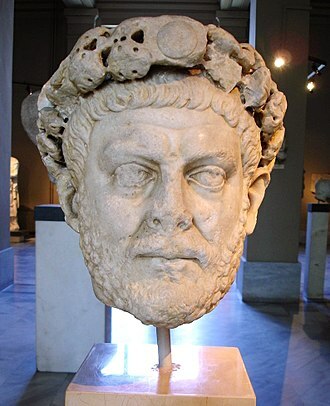 In 348, one of the remaining Pagan Gothic kings (reikos) began persecuting the Christian Goths, and he and many other Christian Goths fled to Moesia Secunda in the Roman Empire, he continued to serve as bishop to the Christian Goths in Moesia until his death in 383 AD, according to Philostorgius. 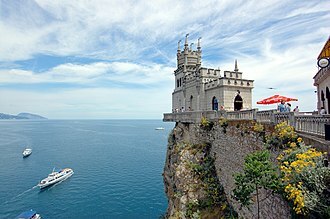 Ulfilas was ordained by Eusebius of Nicomedia, the bishop of Constantinople, in 341 AD. 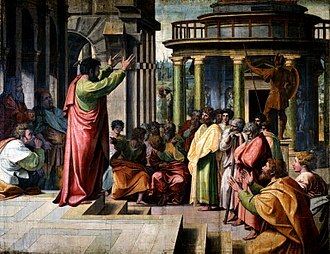 Eusebius was a pupil of Lucian of Antioch and a leading figure of a faction of Christological thought that became known as Arianism, named after his friend and fellow student, Arius. 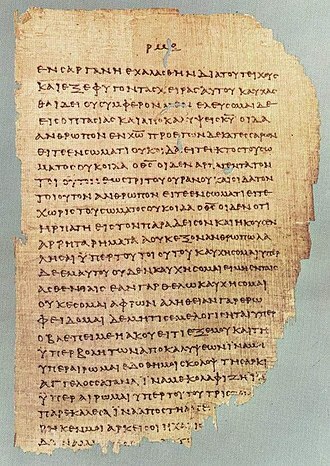 Between 348 and 383, Ulfila likely presided over the translation of the Bible from Greek into the Gothic language, which was performed by a group of scholars., Thus, some Arian Christians in the west used vernacular languages – in this case Gothic – for services, as did many Nicaean Christians in the east. 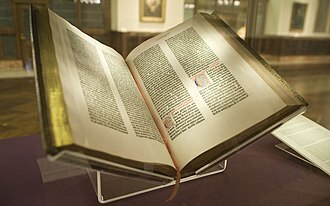 See also: Syriac versions of the Bible and the Coptic Bible), while Nicaean Christians in the west only used Latin, even in areas where Vulgar Latin was not the vernacular. 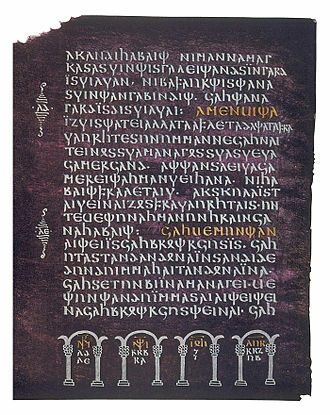 Gothic probably persisted as a liturgical language of the Gothic-Arian church in some places even after its members had come to speak Vulgar Latin as their mother tongue. 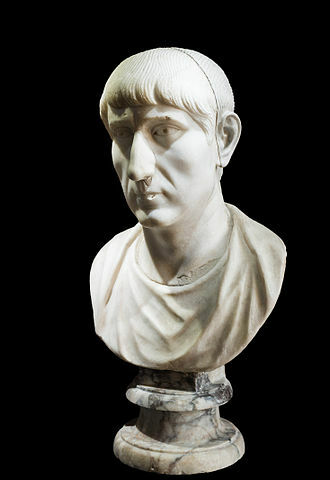 Ulfilas' adopted son was Auxentius of Durostorum, and later of Milan. The Gothic churches had close ties to other Arian churches in the Western Roman Empire. After 493, the Ostrogothic Kingdom included two areas, Italy and much of the Balkans, which had large Arian churches. Arianism had retained some presence among Romans in Italy during the time between its condemnation in the empire and the Ostrogothic conquest. However, since Arianism in Italy was reinforced by the (mostly Arian) Goths coming from the Balkans, the Arian church in Italy had eventually come to call itself "Church of the Goths" by the year 500. ^ Goff, Jacques Le (2000-01-01). Medieval Civilization 400-1500. New York: Barnes & Noble. ISBN 9780760716526. ^ a b c Simek, Rudolf (2003). Religion und Mythologie der Germanen. Darmstadt: Wiss. Buchges. ISBN 978-3534169108. ^ Todd, Malcolm (2000). Die Germanen : von den frühen Stammesverbänden zu den Erben des Weströmischen Reiches (2. unveränd. Aufl. ed.). Stuttgart: Theiss. p. 114. ISBN 978-3806213577. ^ a b Heather, Peter; Matthews, John (1991). The Goths in the fourth century (Repr. ed.). Liverpool: Liverpool Univ. Press. pp. 141–142. ISBN 978-0853234265. ^ a b c d Amory, Patrick (2003). People and identity in Ostrogothic Italy, 489-554 (1st pbk. ed.). Cambridge: Cambridge University Press. pp. 238, 489–554. ISBN 978-0521526357. The Gepids were an East Germanic tribe. They were closely related to, or a subdivision of, the Goths and they are first recorded in 6th-century historiography as having been allied with the Goths in the invasion of Dacia in c. In the 4th century, they were incorporated into the Hunnic Empire, under their leader Ardaric, the Gepids united with other Germanic tribes and defeated the Huns at the Battle of Nedao in 454. The Gepids founded a kingdom centered on Sirmium, known as Gepidia, remnants of the Gepids were conquered by the Avars in the 6th century. Jordanes reports that their name is from gepanta, an insult meaning sluggish, an Old English form of their name is recorded in Widsith, as Gefþ-, alongside the name of the Wends. The Gepids were the most shadowy of all the major Germanic peoples of the migration period, neither Tacitus nor Ptolemy mentioned them in their detailed lists of the barbarians, suggesting that the Gepids emerged only in the 3rd century AD. 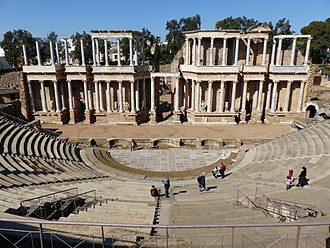 The first sporadic references to them, which were recorded in the late 3rd century, the 6th-century Byzantine writer, listed the Gepids among the Gothic nations, along with the Vandals and Goths proper, in his Wars of Justinian. All information of the Gepids origins came from malicious and convoluted Gothic legends, according to Jordanes narration the northern island of Scandza, which is associated with Sweden by modern scholars, was the original homeland of the ancestors of the Goths and Gepids. They left Scandza in three boats under the leadership of Berig, the legendary Gothic King, Jordanes writes that the Gepids ancestors traveled in the last of the three ships, for which their fellows mocked them as gepanta, or slow and stolid. They settled along the shore of the Baltic Sea on an island at mouth of the Vistula River, called Gepedoius, or the Gepids fruitful meadows. Jordanes passage in his Getica is the following, Should you ask how the and Gepidae are kinsmen, I can tell you in a few words. One of these three ships proved to be slower than the others, as is usually the case, and thus is said to have given the tribe their name, for in their language gepanta means slow. Hence it came to pass that gradually and by corruption the name Gepidae was coined for them by way of reproach. The Sarmatians were a large confederation of Iranian people during classical antiquity, flourishing from about the 5th century BC to the 4th century AD. 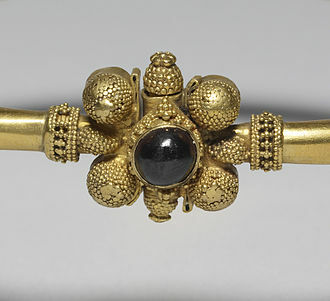 They spoke Scythian, an Indo-European language from the Eastern Iranian family and their territory, which was known as Sarmatia to Greco-Roman ethnographers, corresponded to the western part of greater Scythia. 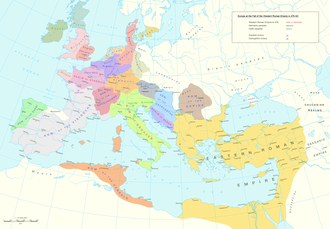 In the 1st century AD the Sarmatians began encroaching upon the Roman Empire in alliance with Germanic tribes, in the 3rd century AD their dominance of the Pontic Steppe was broken by the Germanic Goths. With the Hunnic invasions of the 4th century, many Sarmatians joined the Goths, a related people to the Sarmatians known as the Alans survived in the North Caucasus into the Early Middle Ages, ultimately giving rise to the modern Ossetic ethnic group. The Sarmatians were eventually assimilated and absorbed by the Proto-Slavic population of Eastern Europe. Sarmatae probably originated as just one of several names of the Sarmatians. Strabo in the 1st century names as the tribes of the Sarmatians the Iazyges, the Roxolani, the Aorsi. 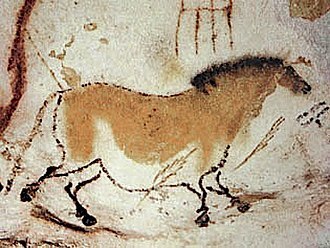 The Greek name Sarmatai sometimes appears as Sauromatai, which is almost certainly no more than a variant of the same name, historians often regarded these as two separate peoples, while archaeologists habitually use the term Sauromatian to identify the earliest phase of Sarmatian culture. Any idea that the name derives from the lizard, linking to the Sarmatians use of reptile-like scale armour. 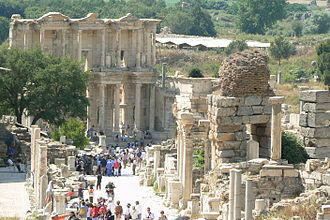 Both Pliny the Elder and Jordanes recognised the Sar- and Sauro- elements as interchangeable variants, Greek authors of the 4th century mention Syrmatae as the name of a people living at the Don, perhaps reflecting the ethnonym as it was pronounced in the final phase of Sarmatian culture. Oleg Trubachyov derived the name from the Indo-Aryan *sar-mat, the Indo-Aryan and Indo-Iranian word *sar-, by this derivation was noted the unusual high status of women from the Greek point of view and went to the invention of Amazons. Other scholars, like Harold Walter Bailey, derived the word from Avestan sar- from tsar- in Old Iranian. It was derived from the name of Avestan region in the west Sairima, recently R. M. Kozlova derived it from *Sъrm- < Proto-Slavic adjective *sъrmatъ, with the meaning that is rich with sormima i. e. shallows, referring to the rivers. The Sarmatians emerged in the 7th century BC in a region of the steppe to the east of the Don River, for centuries they lived in relatively peaceful co-existence with their western neighbors the Scythians. Then, in the 3rd century BC, they fought with the Scythians on the Pontic steppe to the north of the Black Sea, the Sarmatians were to dominate these territories over the next five centuries. Pliny the Elder wrote that they ranged from the Vistula River to the Danube, in 1947, Soviet archaeologist Boris Grakov defined a culture flourishing from the 6th century BC to the 4th century AD, apparent in late kurgan graves, sometimes reusing part of much older kurgans. 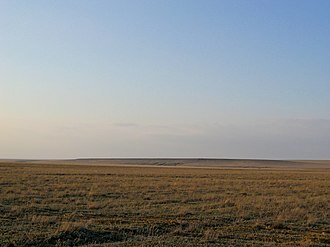 It was a nomadic steppe culture ranging from the Black Sea eastward to beyond the Volga, in Hungary, a great Late Sarmatian pottery centre was reportedly unearthed between 2001 and 2006 near Budapest, in the Üllő5 archaeological site. In ancient Roman religion and myth, Mars was the god of war and an agricultural guardian, a combination characteristic of early Rome. 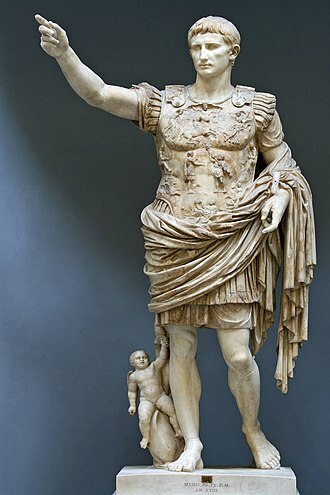 He was second in only to Jupiter and he was the most prominent of the military gods in the religion of the Roman army. Most of his festivals were held in March, the named for him, and in October. Under the influence of Greek culture, Mars was identified with the Greek god Ares, whose myths were reinterpreted in Roman literature and art under the name of Mars. But the character and dignity of Mars differed in fundamental ways from that of his Greek counterpart, Mars was a part of the Archaic Triad along with Jupiter and Quirinus, the latter of whom as a guardian of the Roman people had no Greek equivalent. Mars altar in the Campus Martius, the area of Rome that took its name from him, was supposed to have been dedicated by Numa, the peace-loving semi-legendary second king of Rome. Although Ares was viewed primarily as a destructive and destabilizing force, Mars represented military power as a way to secure peace, in the mythic genealogy and founding myths of Rome, Mars was the father of Romulus and Remus with Rhea Silvia. Like Ares who was the son of Zeus and Hera, Mars is usually considered to be the son of Jupiter, however, in a version of his birth given by Ovid, he was the son of Juno alone. Jupiter had usurped the mothers function when he gave birth to Minerva directly from his forehead, to restore the balance, Flora obtained a magic flower and tested it on a heifer who became fecund at once. She plucked a flower ritually using her thumb, touched Junos belly, Juno withdrew to Thrace and the shore of Marmara for the birth. Ovid tells this story in the Fasti, his poetic work on the Roman calendar. In the earliest Roman calendar, March was the first month, Ovid is the only source for the story. The consort of Mars was Nerio or Nerine and she represents the vital force and majesty of Mars. Her name was regarded as Sabine in origin and is equivalent to Latin virtus, in the early 3rd century BC, the comic playwright Plautus has a reference to Mars greeting Nerio, his wife. A source from late antiquity says that Mars and Nerine were celebrated together at a festival held on March 23, in the Roman Empire, Nerine came to be identified with Minerva. 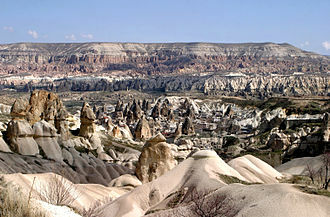 In ancient geography, especially in Roman sources, Dacia was the land inhabited by the Dacians. The Greeks referred to them as the Getae, which were specifically a branch of the Thracians north of the Haemus Mons, Dacia was bounded in the south approximately by the Danubius river, in Greek sources the Istros, or at its greatest extent, by the Haemus Mons. 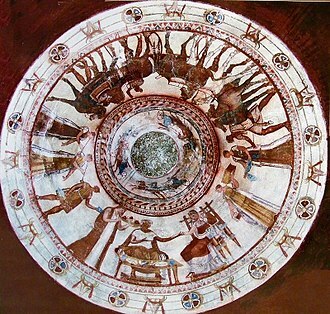 Moesia, a region south of the Danube, was an area where the Getae lived and interacted with the Ancient Greeks. In the east it was bounded by the Pontus Euxinus and the river Danastris, but several Dacian settlements are recorded between the rivers Dniester and Hypanis, and the Tisia to the west. 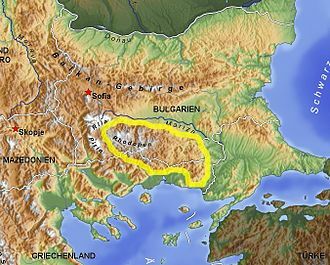 At times Dacia included areas between the Tisa and the Middle Danube, the Carpathian Mountains were located in the middle of Dacia. It thus corresponds to the present day countries of Romania and Moldova, as well as parts of Bulgaria, Hungary. Dacian tribes had both peaceful and military encounters with neighboring tribes, such as Sarmatians, Scythians. 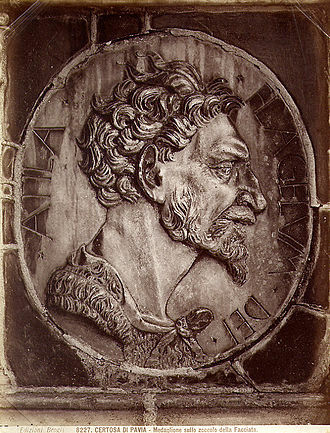 A Dacian Kingdom of variable size existed between 82 BC until the Roman conquest in AD106, the Dacians are first mentioned in the writings of the Ancient Greeks, in Herodotus and Thucydides. The extent and location of Dacia varied in its three historical periods, The Dacia of King Burebista, stretched from the Black Sea to the river Tisa. During that period, the Geto-Dacians conquered a territory and Dacia extended from the Middle Danube to the Black Sea littoral. 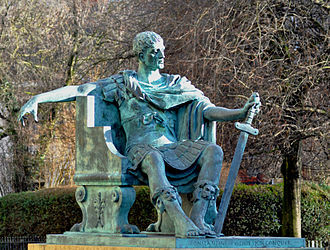 In 53 BC, Julius Caesar stated that the lands of the Dacians started on the edge of the Hercynian Forest. 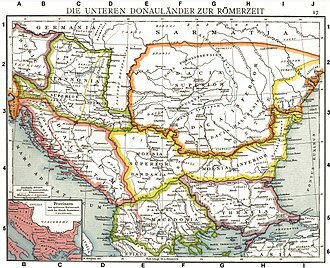 After Burebistas death, his kingdom split in four states, the hold of the Dacians between the Danube and Tisza was tenuous. However, the archaeologist Parducz argued a Dacian presence west of the Tisa dating from the time of Burebista, according to Tacitus Dacians bordered Germania in the south-east, while Sarmatians bordered it in the east. Written a few decades after the Roman conquest of parts of Dacia in AD 105–106, according to the scholars interpretation of Ptolemy Dacia was the region between the rivers Tisza, upper Dniester, and Siret. Funerary stele of Licinia Amias on marble. One of the most ancient Christian inscriptions found, it is from the early 3rd-century Vatican necropolis area, Rome. Upper tier: dedication to the Dis Manibus and Christian motto in Greek letters ΙΧΘΥϹ ΖΩΝΤΩΝ: Ikhthus zōntōn, "fish of the living"; middle tier: depiction of fish and an anchor; lower tier: Latin inscription "LICINIAE FAMIATI BE / NE MERENTI VIXIT". Ulfilas converting the Goths to Arian Christianity.